I read and write a lot about Weimar and Nazi Germany as well as the Holocaust. They were the focus of my undergraduate major working under Dr. Helmut Heussler who served as a translator and interrogator at Nuremberg while I was a student at California State University at Northridge and later in my Masters of Arts in Military History. I read the documents, the histories, the narratives, and the reports both in English and German. I study the perpetrators, the victims, and yes the bystanders as well and there is not enough time in one man’s life to read all of them, but I will try. Likewise I visit the sites where things happened in Germany, and every time that I make a trip to those places I learn more and believe me it is not comfortable. When I visited the Palace of Justice in Nuremberg I saw a picture of Dr. Heussler doing his work. Back then he was very young and it would be a number of years before he finished college and went on to his doctorate. When I saw his picture I remembered just how important he was in opening my eyes to the dark side of humanity; even those people that are not truly evil; those like most of us who exist between the shades of gray between sainthood and the devil. The fact is that there are very few true saints and likewise very few truly evil people. Quite obviously Adolf Hitler and many of his associates fell in the latter category. The rest of us, and for that matter most of the people on all sides during from the Nazi seizure of power until the Gotterdammerung of the Third Reich in in the flames of Berlin in 1945 fell somewhere in the gray area between the truly evil and the saints and truthfully all of us given the right conditions are capable of becoming perpetrators, victims, or the worst, bystanders who turn their backs on evil because it doesn’t seem to affect us; but it does. During our recent blizzard and snow event my wife Judy was away, so one of the nights that I was alone I re-watched the film Judgment at Nuremberg. The film is profoundly disturbing not only because of the subjects that it deals with but also when we look at the great uncertainty time that we live and how similar it is to the world of the late 1920s and early 1930s. 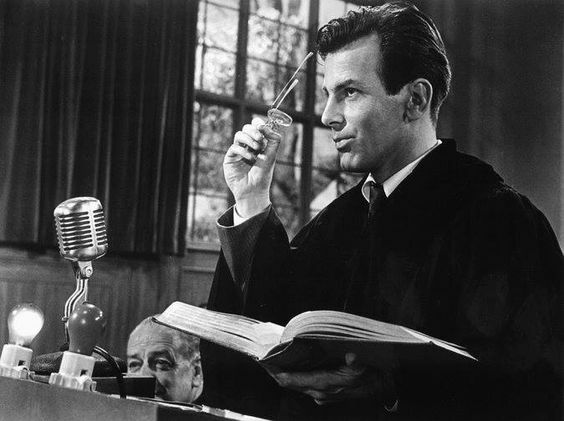 In one of the more disturbing scenes of the film, Maximillian Schell, who played Hans Rolfe, the defense counsel for Ernst Janning, played by Burt Lancaster gives a summation in the final defense of his client who has already admitted his guilt which is remarkable because he tells the truth about the guilt of everyone. Rolfe’s summation of his defense following his client’s admission of guilt is damning. It is something that almost all of us do. It is how we look at the atrocities of genocide, war crimes, ethnic cleansing, the willful starvation of millions by criminal regimes; and then stand by saying little or nothing and doing nothing, sometimes even supporting the leaders or the regimes that commit these actions. So please, no matter what your political point of view, take the time to watch clip or the whole film, and read the transcript of Schell’s speech below. It’s far easier than trying to do all the reading, study, and research that I have done. Have been thinking of you this week – a book called “Fire and Fury: the Allied Bombing of Germany, 1942-1945.” has been selling very well over here as people have muddled it up with Trump’s book! The author says he’s amazed to be on a best seller list after years of selling a couple of copies a week at most. Sounds like a book you’d enjoy. Heard this morning on our news that Trump isn’t coming to open your new embassy because he ‘doesn’t like the building’ – he’s a bit of a joke over here. Kate, I’ve seen good reviews of it but haven’t gotten it yet. As far as Trump goes he is a disgrace and embarrassment. God help us.